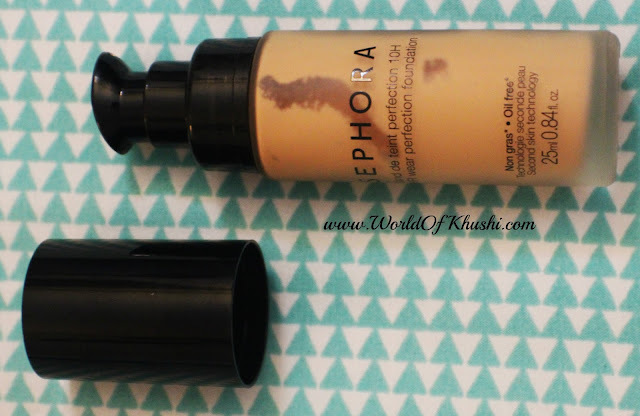 In today's post I am Reviewing 10 HR Wear Perfection Foundation by Sephora Collection. Sephora is one of my favorite place for shopping when it comes to Makeup. They have so many brands with tons of Makeup Options. Few months back I realized that Sephora has its own makeup brand called Sephora Collection where they have everything from lipstick to eyes, face products to skin care to makeup brushes with wide range of shades options. I don't know why I never paid attention towards its collection. The most surprise product was Foundation as they have more than 30 shades to choose from for everyone's skin tone. I bought one Foundation which is too close to my skin tone (can't say exactly) the shade is 23 Light Natural Beige (Y) which is little yellow to me, the girl who was working there told me that this color works for my skin tone. After using for couple of times I can say that yes it's actually stay for 10 hours and gives you natural looking finish. Below is my full Review for this Foundation. A foundation with build-able coverage that instantly conceals blemishes with an invisible, flawless finish. Conceal blemishes, pigmentation marks, scars, and dark spots with this foundation that provides a natural, beautiful finish. This formula blends with your skin tone to create an invisible veil, like a second skin that adapts to all the movements of the face for optimum comfort all-day long. Hyaluronic acid smooths the skin, while antioxidant vitamin E protects against external stressors. Soft focus pigments blur out blemishes and soften the appearance of wrinkles for a youthful-looking, even complexion. Apply a smoothing primer on the face and neck. Apply four small dabs of 10HR Wear Perfection Foundation on the forehead, cheeks, and chin. Using Foundation Brush # 47, blend the foundation as much as possible from the center of the face outwards, and to the neck. Apply evenly close to the eyes, around the nose, mouth, and neck for a homogeneous flawless finish. Gently pat on to avoid lines. Can also be applied with fingertips or a sponge. It comes with round glass bottle with pump and cap, pump makes whole process very easy. You get foundation without wasting any trace!! It comes with large variety of shades to choice from. 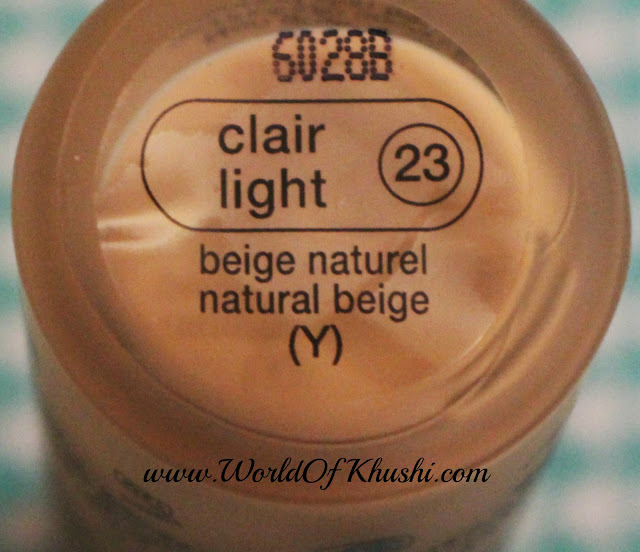 The texture of this foundation is creamy, neither too watery nor very drying. Easily blend-able and doesn't make face cakey. The coverage is medium to build-able, covers marks and redness. Stay for complete 10 hours. 1. Wide range of color options available. 2. The coverage is medium to build-able. 3. Long wearing! It actual stays for 10 hours. 5. Covers redness and marks. 7. Doesn't dry out, even dry skin people can use this. 8. Doesn’t accentuate dry-patches and fine-lines. 9. Plump makes very easy to use. 12. Can be applied by Blender, Brush or Fingers. I don't mind but I guess I already have quite a few foundations and I don't use them often. This is my full Review for 10 HR Wear Perfection Foundation by Sephora Collection. Overall! I love this foundation. It gives me Matte finish without drying my skin. I am not having very problematic skin and yes I do have very bad dark-circles. For Dark Circles I have to have apply Concealer first. Very easy to blend & doesn't give you cakey look. It's good foundation with good price. I hope you girls get some idea about this product. I wish you all the very best. Let me know your thoughts about this product. For more such Reviews stay tuned with Khushi's World. If you guys want me to do any Review of your choice then do let me know!! Guys do like the post & share it with everyone. Follow me on Khushi's World Facebook Page, Google+ , Instagram and Pinterest for more Posts. I will see you in next post till then take care.